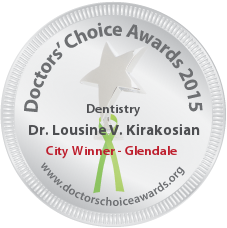 Dr. Lousine Kirakosian is an experienced and well recognized general & cosmetic dentist working with patients in all age groups and using the utmost advanced dental technology. She began her education at the highly accredited Yerevan State Medical University and continued her advanced education at the College Institute of Charity Sisters & Brothers in Yerevan, Armenia, where she received her doctoral degree. Dr. Lousine V. Kirakosian continued her education thru the Advanced Standing Program for International Dentists (ASPID), which is designed to teach qualified dentists from other countries the knowledge and skills found in the United States at the prestigious University of Southern California (USC). Her dedication as a dentist combined with many years of personal and family experience, she is devoted to her profession and never stops learning innovative techniques and materials available in today’s dentistry. She formed her passion for her practice at an early age, following her father Dr. Vahagn P. Kirakosian’s (Ph.D, Professor, Academy of Dentistry International Member) footsteps, a well renowned dentist specializing in prosthodontics. Dr. Vahagn P. Kirakosian is currently the Assistant Dean & Chairman of the Department of Dentistry at the University of Traditional Medicine and for over 15 years was the Chairmen of the Prosthodontics Department of Yerevan State Medical University. Dr. Vahagn P. Kirakosian has not only been a great father, but also a mentor as a dental professional for his daughter, Dr. Lousine V. Kirakosian. 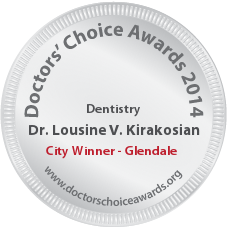 Through her father’s continuous guidance and teaching, combined with a high level of medical education and experience, Dr. Lousine V. Kirakosian is truly a professional at her practice. Her philosophy is to determine and understand her patients’ needs and wants, making sure that they are always comfortable and receive the utmost dental care and an impeccable experience. She is determined to discovering the underlying causes and getting to the root of the problem. By applying the principles of biological, health-based dentistry, Dr. Kirakosian effectively and comfortably helps her patients in improving their oral and overall health and smile in confidence. In her devotion to create beautiful smiles, Dr. Kirakosian holds many certifications to enhance her education and experience in providing patients with advanced techniques and premier options. Dr. Kirakosian is certified in Invisalign – a system that uses clear, removable aligners to gradually move teeth and helps to correct a broad range of dental and orthodontic issues for patients of all ages. Additionally, Dr. Kirakosian has also been certified through Neoss (American Dental Association recognized program) in Implant Dentistry, which offers a comfortable and permanent solution for missing and/or restorative tooth purposes. Being sensitively attuned to the aesthetic and functional concerns of her patients Dr Kirakosian always seeks to offer the best solution for her patients needs. She combines her scientific background with an artistic eye to bring the highest quality of personalized care to each of her patients. Dr. Kirakosian is a caring, gentle and understanding professional. She will listen to your concerns and will address each and every one of them in her treatment. Dr.Kirakosyan and I met 12 years ago. She was passionate about her career, detail oriented in her work, patients priority first. 12 years later she is still all that plus more experience. And when I need dentistry for my self, her office is always one phone call away. 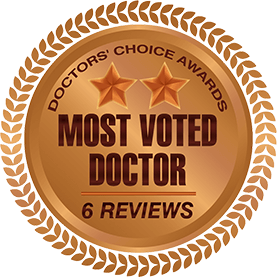 Dr. Kirakosian is a great professional, caring and loving doctor. Her work is fulfilled with passion, love, knowledge and she is always on the top edge of technology and the best that dentistry can offer. I absolutely believe that she is a wonderful candidate for this award. She absolutely deserves it! I have gone to dental school with Dr. Kirakosian. She is a friend and a respected colleague . She has treated my immediate family members and many of my friends . Dr Kirakosian is very honest, empathetic and detail oriented . I would highly recommend her to anyone !! I have known Dr. Lousine Kirakosian for over 10 years. She is a very professional, knowledgeable, caring and meticulous dentist whose primary focus is her patients. I would have no reservation in referring my family to her dental practice. A very caring and highly professional dentist. She has diagnosed and treated teeth that otherwise were deemed “ruined”. The only dentist that I don’t hate to go to. I highly recommend her. I would refer my family and friends to her, as my children are already her faithful patients. I have had the privilege of knowing and working with this class act for over 10 years. Dr Kirakosian never ceases to amaze me with all her skill, enthusiasm, level of care and honesty. Her patients always come first and the exquisite level of dentistry showcased in international journals and symposiums is a testament to her dedication. No other dentist in Los Angeles is more deserving of this award.